They are not phonies and they are not imitators. The Osmonds are real people. Their music is real and as lifelike as their personalities. The Osmonds did not need gimmicks nor stimulants to take them to the top. No, they are not super-people. They are realistic people. They have reached the top on sheer talent. People say it can’t work. It has worked. The pictures in this album do tell a story. The Osmonds have come to the top. Hopefully, the Osmond Brothers and this album will make the music field a better place for everyone. Now, meet and hear the Osmonds, Alan, Wayne, Merrill, Jay, and Donny. As for Merrill’s vital statistics, he is 5’11”, 140 pounds, has brown hair and hazel eyes. Jay: Jay is the unbelievable drummer of the group. Offstage, Jay jokes a lot. He is the one that has one-hundred different ideas coming all at once. But on stage, Jay is the premier drummer in popular music today. If there were a way to describe Jay (you really can’t, Jay is Jay), you would have to list his laughter as his best quality. When he laughs, the whole group laughs. It must be his personality that makes him this way. But whatever it is, the whole group is thankful for Jay. Jay is 5’11”, 135 pounds, has brown hair, and brown eyes. Donny: Donny is the youngest member of the group and is also the rage of the fans. Donny is the pretty boy and that comes with all its consequences. Girls write to him by the thousands, and tear after him whenever they are on tour. It is not unusual for Donny to be rescued by policemen in his desperate moments. Donny plays the organ in the group. Even at his young age, he is probably one of the best organists in the field today. Donny’s best quality is his cheerfulness. He can cheer anybody up. Donny never has a bad thought toward anyone. Physically and spiritually Donny is a beautiful person. Donny’s vital statistics…5’1”, 95 pounds, brown hair and brown eyes. Wayne: Wayne is the quiet member of the group. It is not that he shy, but he talks only when he feels it is necessary. Wayne is a very spiritual person. If anyone can make you feel wanted at times when you are not sure, Wayne is the person that can do it. He is content that he is doing his best possible job. Wayne’s most important quality is spiritual contentment. Wayne is always himself. He feels the same as the other brothers, “It’s just too hard to act 24 hours a day.” Wayne plays rhythm guitar and he plays it expertly. Like the other boys, it is not unusual for Wayne to be called to do someone’s studio session. As for vial statistics, Wayne is 5’11”, 150 pounds and has brown eyes and brown hair. Alan: Alan is the leader of the group. He’s very concerned about “now” things. Like all the brothers, Alan is a very peaceful and sensitive person. He has a place in his heart for almost anything. He is the type of person you like to call your friend. He’s understanding, brotherly, and a warm person. That is Alan’s most important quality – warmth. Perhaps Alan’s warmth has rubbed off onto other people. After meeting Alan and the Osmonds you must think twice before doing anything wrong. Alan plays lead guitar for the group. He has attained perfection on this instrument and can play many instruments with an expert touch. As for vital statistics, he’s 6’1”, 160 pounds, brown eyes, and has dark brown hair. Now you have met the Osmonds. They are professional in every sense of the word. In the 1950’s it was a man who wiggled his way to stardom who became a phenomenon. In the 1960’s, four long-hair lads from England invaded the world and became a phenomenon. 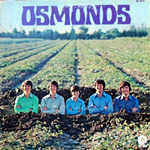 The Osmonds are riding up the Hot 100 currently with One Bad Apple included here. The LP, like the single puts the boys in a whole new commercial bag, right in today's market. 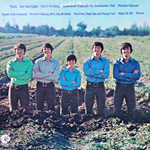 Cut in Muscle Shoals by producer Rick Hall, the package offers top treatments of He Ain't Heavy, He's My Brother and a Motown salute that is a heavy stand-out. Should prove to be a big chart winner. - Billboard Magazine, January 9, 1971. This album also charted on Billboard Magazine's Best-Selling Soul LP's. It was on this chart for 13 weeks and the top chart position was #13 for two weeks in March 1971. The album earned a gold record on September 13, 1971.